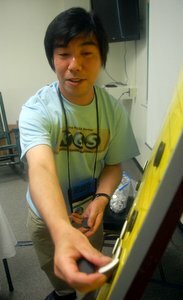 Maeda Ryo 6P, the popular Japanese professional who’s a regular attendee at the annual U.S.Go Congress, is organizing a 3-week intensive go camp in Osaka next year. “I guarantee a 3-stone improvement for kyu players,” Maeda (at left) smilingly told the E-Journal Monday, “and one stone for dan players.” Classes will run five days a week, with two days off for sight-seeing to places like the Shusaku Memorial Museum in Innoshima as well as Kyoto, Nara and Himeji. Campers will play league games in the morning, with teaching games with pros – 4-5 will be available daily — in the afternoon, along with lectures, quizzes and simuls, and in the evening there will be casual games with local amateur players. Li Ting 1P — another popular Congress pro — is also helping organize the camp, along with Hayashi Kouzou 6P, with the support of the Kansai Ki-in. Email Osaka.go.2013@gmail.com for more info or to reserve your space.